GDG Philippines: Save the Date: Pre-Startup Weekend Bootcamp! Save the Date: Pre-Startup Weekend Bootcamp! UPDATE 04/16/2013: Regular tickets are now sold out! At this point, we will be sending tickets to registered Startup Weekend Manila attendees only. Please add yourself to the waitlist so we can manually send you a ticket. Once we send it out, you need to respond within 24 hours in order to secure your slot. Yes, the bootcamp is free! Should you wish to attend Startup Weekend on April 26 to 28, please head on over to the Startup Weekend Manila registration page. How will GDG members benefit from this partnership? Just like before, GDG members get 20% rebate on Startup Weekend tickets! Please send an email to gdgphilippines@gmail.com to request for instructions. Don't forget to include your name, location, and the last GDG event you attended. Rebates will be given during Startup Weekend Manila. Also, Google is offering startups $1,000 of credit to start building applications on Google App Engine. Apply for App Engine for Startups at http://cloud.google.com/startups. We'll be discussing the program in detail (including the GAE verification code) during the event. 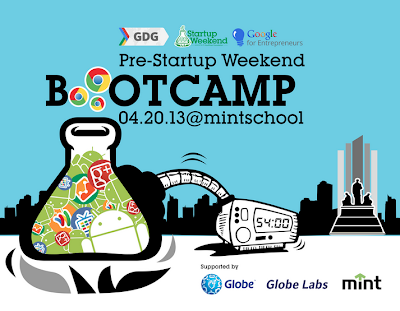 We'd like to thank everyone who made this bootcamp possible: Google, Startup Weekend, GlobeLabs, and MINT College!